When I was a little girl, my mom made almost every thing from scratch. I think this was part necessity, and part attempting to show that she could “do it all” as a mom: homemade goodness while working in the home teaching piano lessons and babysitting. She was wonder woman. I remember one thing that she made from scratch was hamburger buns. To this day, I think a phenomenal bun take hamburgers to the next level. Hand-shaped Angus hamburgers from the grill, dripping with mayo and ketchup is still one of my favorite indulgences. 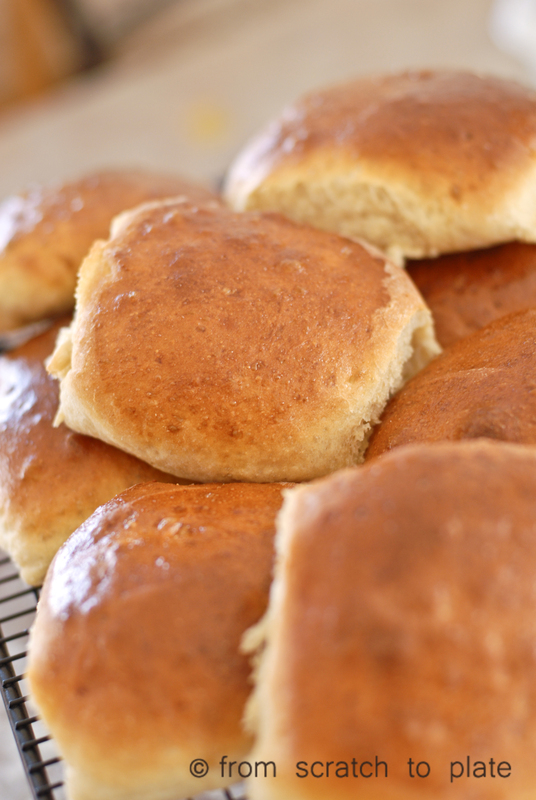 Make these buns for your next grill-out and wow the guests…or your family. In your stand mixer, combine milk, water, yeast, and sugar. Let sit 5 minutes, until foamy. Mix in the beaten egg. Add 2 cups of flour, the salt and the gluten, and mix with your dough hook until incorporated. Add additional flour as needed in 1/2 cup increments until dough sticks together. Be careful to add as little flour as possible, just enough to hold the dough together. Mix in the butter. Let mixer knead the dough on low for 8 minutes, or until smooth and elastic. The dough should be very soft. Remove bowl, cover with a towel and allow to rise in a warm place until double, typically about an hour, but it will vary. Dump the dough on a counter, sprinkled with flour. Divide the dough into eight pieces. Line your baking sheet with parchment paper (yes, I know I didn’t…and I regretted it). 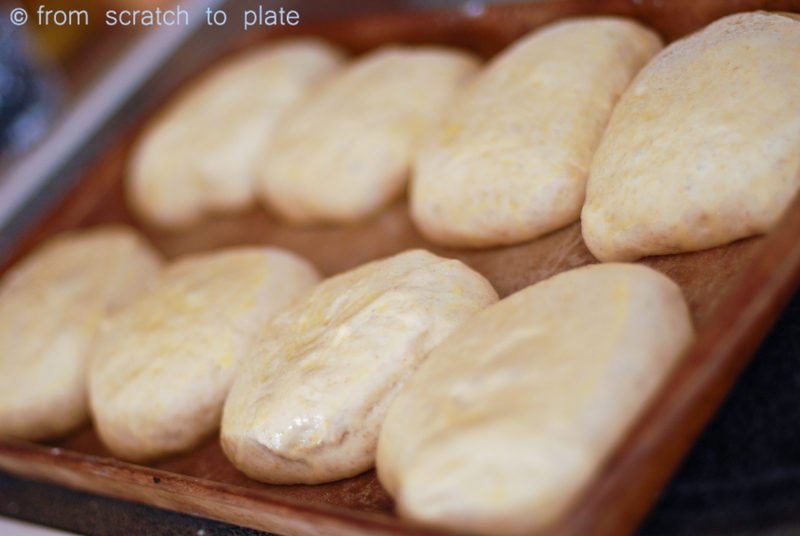 Roll each piece of dough into a ball and place on the baking sheet, 2 inches apart. Place in a warm area and allow to rise until double, about an hour. Preheat the oven to 400 degrees. Place a pan half-full of water on the lowest rack of the oven. Combine the egg and water. 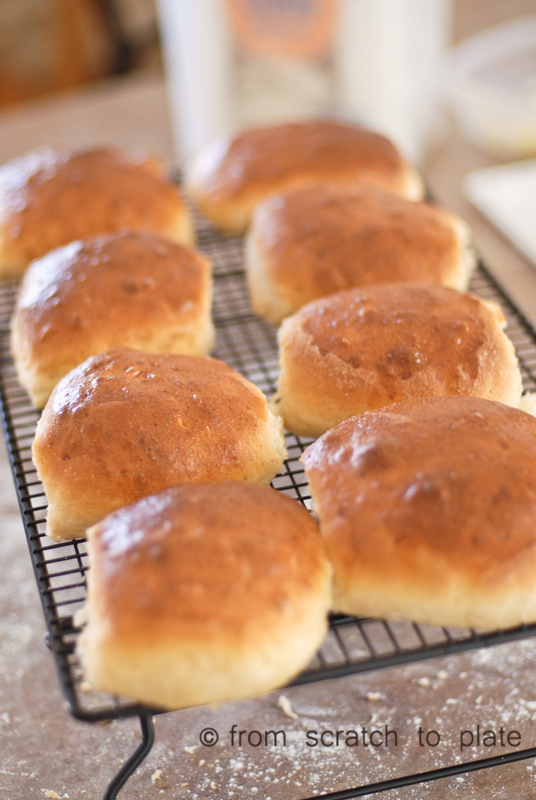 Very carefully, brush the tops of the buns lightly with the egg wash. Bake the rolls on the center oven rack for 12-15 minutes, until the tops are golden brown. Cool on a cooling rack. 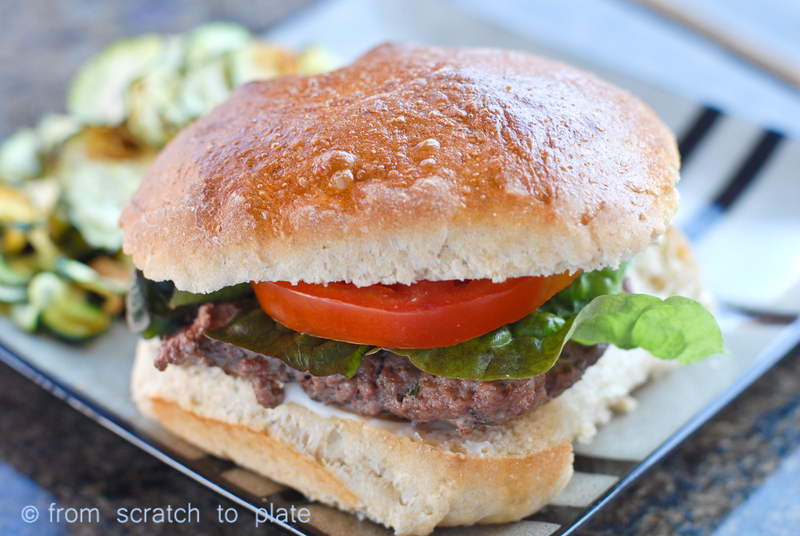 For the ultimate burger, Brush with melted butter and lightly toast on the grill or under a broiler.